Find the original story on Ujjivan’s website. Ela Ramesh Bhatt is a gentle revolutionary, who is one of the pioneers in women empowerment and financial inclusion in India and abroad. She is a Gandhian to the core and believes that self reliance is the key to eradicate poverty. There was a time, not long ago, when it was practically impossible to imagine solutions big and smart enough to deal with biased and unjust treatment to women globally. But Ela Bhatt revolutionized the whole idea of women empowerment through her humble yet bold approach towards the issue. Ela Bhatt is called Elaben, which mean “Ela, my sister”; so will we because she has been constantly inspiring us to challenge our limitations. Elaben was born on 7-Sept 1933. Ela was born in a middle class educated family in Gujarat. Her grandparents worked with Mahatma Gandhi in the non-violent struggle. Young Ela was deeply influenced by Gandhian philosophy and started following it. She is an advocate by training and started her career as a teacher and later a legal expert in department of Textile LabourAssociation in Ahmadabad. During this tenure she realized that, self employed women are denied of entitlements and privileges accessible to their male counterparts. She then decided to organize these women to get them their well deserved rights. She started working with vegetable vendors, rag pickers, cigarette rollers and such, who were fighting their way to economic independence, a fair wage and freedom from chains of poverty. She fought with them for fairness through self reliance. 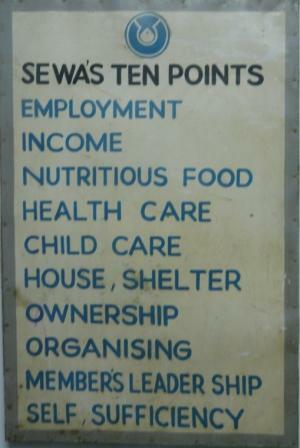 Thus formed; SEWA (Self Employed Women’s Association), a trade union for self employed women. A year later they came together to form a bank to build assets, save, borrow, and thus build a better life – which is the Cooperative bank of SEWA, the first ever women’s bank. The idea was triggered by a thought of one of the sisters of SEWA; “We may be poor, but we are so many. Why don’t we start a bank of our own? Our own women’s bank, where we are treated with the respect and service that we deserve.”Elaben later authored a book titled we are poor but so many: the story of self-employed women in India in 2006. SEWA, through its several initiatives and sister organizations is committed to the cause of ending poverty by giving poor people an equal shot at a healthy, productive and fulfilling life, with access to markets, credit, training, and thus translate their inherent abilities to higher standard of living and greater opportunity. SEWA is a trade union registered in 1972. It is an organization of poor, self-employed women workers. These are women who earn a living through their own labour or small businesses.They do not get fixed income and benefits like workers in organized sector. SEWA’s aim is to organize these poor working women for full employment with all entitlement like work security, income security, food security and social security (at least health care, child care and shelter). SEWA is both an organization and a movement. The SEWA movement is a confluence of three movements: the labour movement, the cooperative movement and the women’s movement.SEWA has several sister organizations helping SEWA members with marketing, health, education and all forays of life. Gujarat is one of the worst hit states in terms of natural calamities. During the drought of 2000, SEWA implemented a customized drought relief activity by helping its members set up region specific sustainable livelihood. In Kutch, craft activity was tried out as a means of livelihood, while in Surendranagar, salt activity proved to be the livelihood providing activity. In Banaskantha, entire regional development was taken up, including crafts, salt and fodder. The work in various areas of artisan support programme, forestry programme, masonry training programme and rainwater harvesting work generated around 2.75 lakh man days of work for around 10,000 families. Soon the state was affected by the worst earth quake ever happened in India. SEWA extended help for rehabilitation and livelihood security for all those many thatlost their home, family and hopes. From the experience of implementing relief activities in various natural calamities SEWA set up a “livelihood security task force” comprising of representatives from government, NGO and experts in the area of disaster mitigation. A “livelihood security fund” has been set up help mitigate the effects of natural calamities. SEWA bank offers an array of financial products to its customers including savings, recurring deposit, pension, loan, fixed deposit, insurance etc. Every product is tailor made for the needs of women. The recurring deposit includes customized products for building own house, marriage of children, for natural calamities that might strike and buy gold for an occasion. Many of these ideas were considered challenging and impossible earlier. But with efforts pioneered by Elaben, a lot of it is being accepted and embraced. Elaben challenged the views and ambitions of her counterparts about filling the gap between rich and poor. The same has inspired a lot of visionaries and organizations. She has spent nearly every minute of the past few decades striving to help women of India attain a life of dignity and freedom and peace. She helped women and girls in India to start small businesses, get equal wages as men, skip an illicit marriage and go to school, open their bank account and a lot more. She helped them gain respect from their husband, father, mother, in laws and whole of society. Elaben is a founder or member of many progressive and innovative groups and organizations working towards equality, independence and self reliability of poor globally. She is a member of The elders, founded by Nelson Mandela; a group of world leaders who contribute their wisdom, independent leadership and integrity to tackle some of the world’s toughest problems. Elaben is particularly involved in The Elders’ initiative on equality for women and girls, including on the issue of child marriage. Some of the organizations, Elaben has created and inspired are Sa-Dhan (the All India Association of Micro Finance Institutions in India), The Indian School of Micro-finance for Women, Women’s World Banking, The International Alliance of Home-based Workers (HomeNet), Women in Informal Employment: Globalizing, Organizing (WIEGO), Women’s world banking and International Alliance of street vendors. Elaben became a founding member of WWB in 1980, served as chair of the Board of trustees in the 1990s, and remains a member of WWB today. Women’s World Banking (WWB) is a nonprofit organization that provides strategic support, technical assistance and information to a global network of 40 independent microfinance institutions (MFIs) and banks that offer credit and other financial services to low-income entrepreneurs in the developing world, with a particular focus on women. Elaben affirms that WWB is one of the organizations of women helping them to understand themselves, improve their skills, and make their presence felt in world affairs. The most important goal is that women gain political visibility, and make a dent in the revision of policies and create policies. Among the accolades she has won are Ramon Magsasay award for community leadership, PadmaShri and Padmabhushan by Govt of India, Niwano peace prize, Radcliffe medal, Indira Gandhi prize for peacesand anhonorary doctorate from Harvard, Georgetown and Brussels University. She was a Member of the Indian Parliament (Rajya Sabha) and subsequently the first female Member of the Indian Planning Commission. Elaben was inducted as director of RBI in 2011. Elaben believes that keeping poor people poor is violence. In her acceptance speech on receiving first ever Global fairness award she said “Because where there is poverty, there is injustice. There is exploitation—of the individual, of the community and of the environment. Where there is poverty, there is discrimination. Where there is poverty, there is fear and intimidation in the community, in the family, in the work environment. Where there is poverty, we can assume rigid hierarchy and inequality. Consequently, where there is poverty, there is also enormous vulnerability. Poverty is a form of violence; it does not respect human labor, it strips a person of humanity, and it takes away their freedom.” Her story and philosophy can be explained in three simple words “Women, Work and Peace”. My first interaction with Elaben was a letter of complaint! I wrote to her about Sa-Dhan refusing our membership, when Ujjivan was in a start-up phase in 2005. Sa-Dhan had a rule that a MFI had to be in operation for two years before you could apply for membership. This I thought contradicted with the development role of Sa-Dhan. Over the years, I had the privilege to meet her number of times. One of these has a special place in my heart. I am a board member of Women’s World Banking (WWB). Elaben and a number of women leaders from around the world founded WWB a few decades ago to promote universal financial inclusion, livelihood promotion and empowerment of women. She continues to be an Honorary Board member for life of WWB. After one of the rare WWB board meetings she attended located at Ground Zero in Lower Manhattan at Moody’s Head Office in the new World Trade Centre building, both of us were trying to head back to Yale Club at mid-town Manhattan. It was early evening and the office hour rush was at its peak. No cabs were available and it started drizzle. While we were standing at the curb, Elaben sighted a cycle rickshaw! She eagerly told me let’s take it. I was apprehensive to negotiate the New York traffic in rush hour in a rickshaw. But she was quietly persuasive. So we were soon weaving through the traffic with this crazy East European immigrant as the driver. My heart was in the mouth but she was cool as a cucumber merrily enjoying the ride. She even sighted some of her friends on the way – Professor Jagadish Bhagwati’s wife. We reached safely & paid the driver handsomely at her insistence. This was the most memorable rickshaw ride in my life! I related this experience to Vijay Mahajan and he told me how Rahul Bajaj had gifted her, an auto, which was official vehicle for many years!